The Off Broadway Alliance will again sponsor 20at20, the bi-annual celebration of Off Broadway. The popular promotion, which begins September 4th and continues through September 23, makes $20 tickets for more than 30 Off Broadway plays and musicals available to theatre-goers twenty minutes prior to curtain. Now in its 6th year, 20at20 has become one of New York’s most eagerly-anticipated promotions for budget-conscious theatre-goers. Peter Breger, Chairman of the non-profit Off Broadway Alliance said: “We are thrilled to once again offer $20 tickets to many of New York’s most popular Off Broadway shows, including three winners of the Off Broadway Alliance Awards: SILENCE! The Musical, Stinkykids The Musical, and NEWSical The Musical. Since Off-Broadway has performances to fit everyone's schedule, you can see more than one on weekends: on Saturday for example, you can see Gazillion Bubble Show at 11 AM, Avenue Q at 2:30PM, Sistas the Musical at 4:30PM, SILENCE! The Musical at 8 PM and Fuerza Bruta at 10PM! Where else can you see five shows in one day, for less than the price of ONE BROADWAY TICKET? Once again, if you see seven Off Broadway shows during the OBA’s Fall 20at20 promotion, you can enjoy a FREE DINNER on us! See any seven of the participating 20at20 shows between September 4th and September 23 and receive a voucher for free dinner for two at an area restaurant. Just mail your original ticket stubs (no photocopies accepted) for seven 20at20 shows to: 20at20 Dinner Special, 555 Eighth Avenue, Suite 905, NY, NY10018. All entries must be postmarked by September 24th to be valid. Please include your name, phone, email, and mailing address. 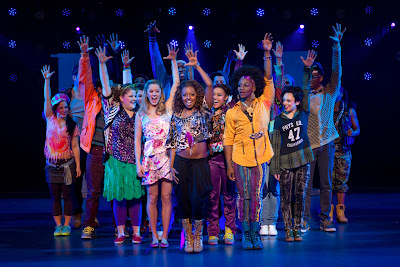 20at20 is presented with additional support from Playbill, BroadwayBox.com, BestOfOffBroadway.com, BroadwayInsider.com, TheMenEvent.com and 8Coupons.com. For complete info on 20at20 go to www.20at20.com or address any question via email to contact@20at20.com. 20at20 Terms and Conditions: All tickets subject to availability. Restrictions may apply. Offer valid only at the box office on the day of the performance twenty minutes prior to curtain. Offer may be revoked at any time. Not valid on prior sale. Cannot be combined with other offers. Valid September 4-23, 2012. Cash only at all venues. Additional restrictions may apply. Free dinner offer valid while supplies last. A limited number of dinner vouchers are available. No substitutions will be given. You will not be able to choose your restaurant. Voucher is subject to restaurant's restrictions. The ensemble. Photo: Carol Rosegg. It is a musical adaptation of Anna Christie, by Eugene O'Neill. Now, you might be asking, "Musical? O'Neill?" It is a little hard to put those two concepts together, but Abbott's book just touches the surface of the playwright's brooding 1922 Pulitzer-Prize-winning play. Anna (Margaret Loesser Robinson) returns to the New York waterfront and her barge captain father, Chris Christopherson (Cliff Bemis), who tries to hide his drunken state and girlfriend, Marthy (Danielle Ferland) to impress the daughter he hasn't seen in 15 years. Christopherson had sent 5-year-old Anna to live with relatives in rural Minnesota after her mother's death. Anna has a few things to hide herself, like the fact she's not the nurse her father believes her to be. Instead, she has been working as a prostitute following years of abuse at the hands of her farm relatives and is hoping to start life fresh with him in the big city. Christopherson rescues a young sailor, Matt (Patrick Cummings), and he and Anna fall in love over her father's objections. When Marthy reveals Anna's secret, everyone's happiness is threatened. Given the often less-than-happy tale, Merrill's score is really upbeat and catchy. "Did You Close Your eyes" is quite a moving and haunting duet. 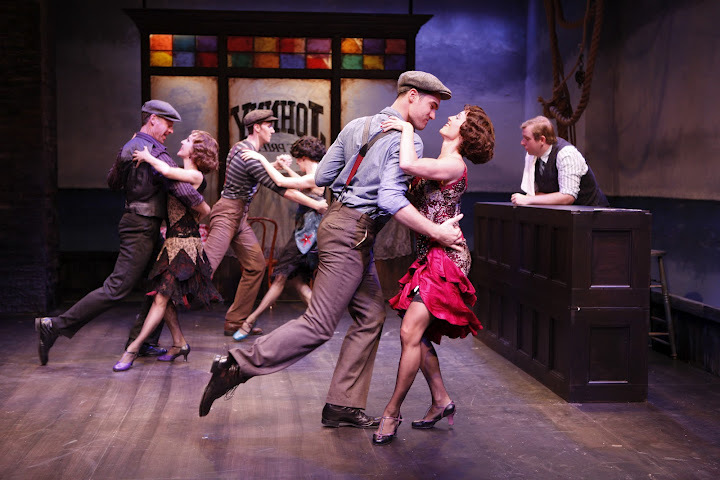 McNabb does the score justice with choreography that efficiently moves the 11-member ensemble around on the small stage. James Morgan's set changes with the help of lighting (Mary Jo Dondlinger) and video (Richard DiBella, design). Loved China Lee's flapper dress design. The band is housed stage right and Moore adds the nice touch of having the saxophone player (Jeremy Clayton) join the action. All of the performances and vocals are strong. It's a nice tale of redemption, people changing and of the life-changing force of forgiveness. Nothing to speak of, except that if you're a big Anna Christie fan, this musical version, which originally starred Gwen Verdon, probably won't be meaty enough for you. Repertory Theatre, 132 West 22nd St., between 6th and 7th avenues; Wednesdays at 3 and 8 pm, Thursdays at 7 pm; Fridays at 8pm; Saturdays at 3 and 8 pm; and Sundays at 3 pm. 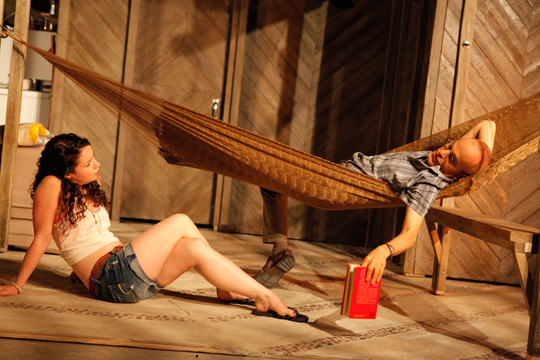 Tickets are $55 and $65, and are available by calling 212-727-2737 or online at www.irishrep.org. -- No notes besides the content mentioned. Give me a G, give me an R, give me an E, give me an A, give me a T. What does it spell? Great. and if you add "fun" after it, you have the description for Bring It On, the Broadway musical that has audiences, with lots and lots of young people in them, cheering. Based on a series of movies (direct to DVD) about rival cheerleading squads, this musical version has a peppy score from Pulitzer Prize winner Tom Kitt (Next toNormal) and Lin-Manuel Miranda (In the Heights) that propels tumbling, pyramids and flying cheerleading routines (Andy Blankenbuehler directs and choreographs). Miranda and Amanda Green write the very clever lyrics and Jeff Whitty pens the book which differs quite a bit from the movies (credited as a libretto). Campbell (Taylor Louderman) has all her dreams come true when she is selected cheerleading captain at Truman High. She intends to lead her squad which includes most-popular-girl Skylar (Kate Rockwell), Kylar (Janet Krupin), newbie Eva (Elle McLemore) and boyfriend Steven (Neil Haskell) to the national championship. The pyramid collapses, however, when a school redistricting sends her and geeky school mascott Bridget (a very funny Ryann Redmond) to the very different world of inner-city Jaskson High. The creatives put the right formation to work here -- don't take anything seriously. There is humor, a decent book and Kitt and Miranda's music (you can hear the variation between pop and hiphop). The score doesn't achieve the level of their previous works, and some numbers seem penned merely to give the performer a reason to belt, but they are catchy and fun, or moving. The sparse set (David Korins, design) enhanced by video projections (Jeff Sugg, design) brings on key elements to set up a location, then rolls them away to leave room for the cheerleading routines performed an ensemble of 25, including some of the nation’s most skilled competitive cheerleaders with more than 25 national and 50 team titles in gymnastics and cheerleading. Andrea Lauer completes the look with costume design for the squads and high school kids. You can't help but smile through most of the show -- especially when you look around and see all of the really young people in the audience who cheer and gasp with pleasure and surprise. 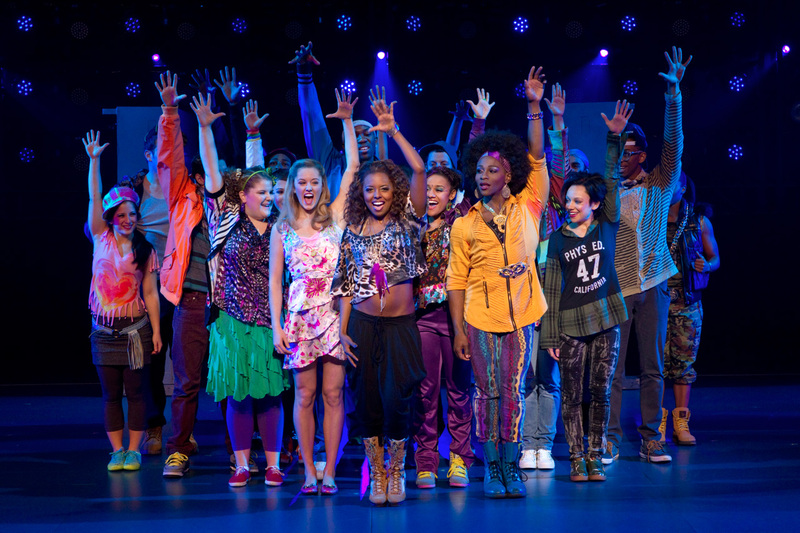 Bring It On has been extended through Jan. 20 at the St. James Theatre, 246 West 44th St., NYC. For tickets and information, visit http://www.bringitonmusical.com/. Donna Murphy and Tess Soltau. Photo Credit: Joan Marcus. 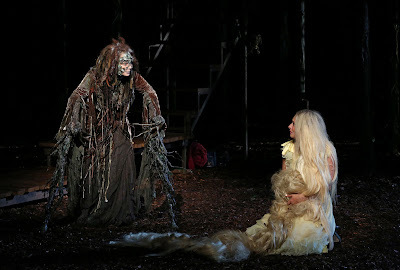 Setting Stephen Sondheim and James Lapine's musical Into the Woods Central Park's Delacorte Theater as part of the Public Theater's Shakespeare in the Park offerings with stars like Donna Murphy, Glenn Close and Amy Adams would seem the stuff of fairytales. The set is magical -- a three-story tree-house sort of forested stage (John Lee Beatty and Soutra Gilmour, design) fabulously lighted (Ben Stanton, design) to showcase the not so distant trees and woods of Central Park providing an enchanted backdrop, but the vision for the production by Director Timothy Sheader and Co-Director Liam Steel, who collaborated on an Olivier-winning version of the show in London's West End, makes it difficult to see the forest through the trees. In trying so hard to clear a different path through the woods, the creative team loses its way. Here, for instance, the role of the narrator, usually performed by a man who doubles as the Mysterious Man (Chip Zien), is played instead by a young boy (Jack Broderick). At first glance, it seems a good idea since the story revolves around a bunch of fairytale characters. But Sondheim doesn't just embellish the tales of Cinderella (Jessie Mueller) and her evil Stepmother and Stepsisters (Ellen Harvey, Bethany Moore and Jenifer Rias), Little Red Riding Hood (Sarah Stiles) and the Wolf (Ivan Hernandez), Rapunzel (Tess Soltau) the Witch (Murphy), the Baker and His Wife (Dennis O'Hare and Adams) or Jack (Gideon Glick) and his mother ( Kristine Zbornik) of Beanstalk fame. He mutates them into commentary on society, on the giants we face in everyday life and on motivations and self preservation. Such heavy themes need the anchor of the adult voice in the narrator, not the "Let's-read-a-fairytale" voice of a kid (especially when the others gang up on him in murderous fashion when they aren't happy with the way he's telling the story). Another change in this production, that can only be classified under the "what-were-they-thinking?" category are the costumes designed by Emily Rebholz. A few of the characters look like what we expect: Cinderella in a lovely white ball gown, the Baker's wife in a dress and apron, but some others boggle the mind. Red Riding Hood shows up in a red denim jacket, helmet and knee pads looking like she's going for a skate through the hood. The Wolf, even more unattractively, looks like Fabio in a fur-skin coat (and there is some sexual innuendo between the two); Cinderella's Stepmother sports a Grace Jones hair do and wears leather. The most disturbing is the witch. She looks like something evil the earth has puked up, which is fine as far as evil witches go, but it's those odd appendages that don't make sense. She has two mossy, vine covered extensions to her root-like finger nails that look like they would be a creative way to incorporate crutches into the costume for a performer with a broken leg, but which seem to serve no purpose except to distract us here. Even Milky White, Jack's beloved cow which he trades for magic beans, is odd: a creepy two-piece puppet with a head detached from its skeletal-looking body. And Jack comes off here as mentally challenged, rather than as innocent and trusting. Losing the costumes and the characters we know from the fairytales takes away from some of the original sarcasm intended in Sondheim's book and lyrics, it seems. Putting characters so far away from the audience in the upper levels of that treehouse setting removes us from the production as well. (Rapunzel's tower at the very top was blocked from my sight line by an audio speaker). The first act seems interminable at one and a half hours (and the three-hour-15-minute total run time did not provide a happily-ever-after for my back. Those wooden seats at the Delacourte are hard. Bring a cushion). A number of performers flatting out (which admittedly isn't hard to do while singing Sondheim's score) didn't help. Paul Gemignani music directs. The 11-piece orchestra appears to be hidden behind the second level of the tree house. OK, so what is right with this production? I enjoyed Murphy's performance very much. She lands solid vocals (she is always a pleasure to listen to) and adds nice layers to the witchy character. Stiles is very entertaining as the snarky Red Riding Hood with a tittering laugh. And Glenn Close as the voice of the Giant was probably the best and scariest I have ever heard. Then there are the wonderful songs including "Into the Woods," "Agony," "No One is Alone" and "Children Will Listen." For those interested in a more family-friendly version, just the first act (before things go downhill toward the less-than-happy ending) will be presented at a matinee Wednesday, Aug. 22. Click here for information about that performance. 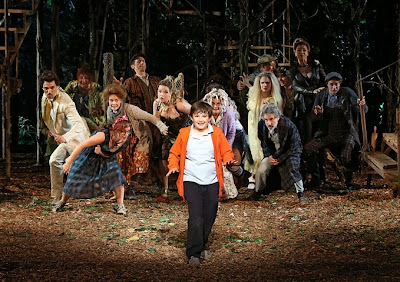 Into the Woods has been extended to Sept. 1 at the Delacorte Theater (entering at 81st Street and Central Park West.) For tickets and performance information, visit http://www.shakespeareinthepark.org/. -- No content notes beyond what's already mentioned, but this is definitely for older kids -- at least 12, I would suggest -- despite the fairytale theme. It's a bleeping story about a bleeping bunch of bleeping people who bleeping yell at each other bleeping all the time. Somewhere in the middle of the profanity, they also come into the presence of the gun which was used in an assassination attempt on Adolf Hitler, eat a disgusting meal together and tell a lot of shocking, off-color jokes. It feels like a trip down memory lane by a couple of friends (which Harrelson and Hyman are in real life) about their under-the-influence times in Houston, TX in 1983. Hyman, like Frankie (Rollinson), his counterpart in the play, went to Texas in early 1980 to find work. That's where he met Harrelson. David Coomber is a hoot as Clint, the "Is-he-gay?" roommate of Harrelson alter-ego Zac (Coffey) and Frankie (who runs around in his underwear and has a contagious laugh). Coomber recreates the role which won him the 2011 BirdL.and Theater Young Actor Award in Toronto where this play had its world premiere. Also fun is Cotton as plain-speaking Jackie. Video projections (Imaginary Design) accompanied by popular music from the era (Brett Jarvis, sound design) set the otherwise sparsely trussed stage (Dane Laffrey, sets). Lack of a cohesive plot for starters. The main purpose seems to be to see whether the playwrights can challenge David Mamet for the most uses of the "F" word in a script (I think Mamet might still be the champ, but this work gives him a serious run for the title). In between individual couples yelling at each other or everyone yelling at each other en group (the volume is way up there), there are some jokes that seem to be thrown in for shock value, more than for having any tie to whatever is supposed to be happening on stage. It's one of those plays that gets an Off-Broadway run on the merit of a star name attached (and there did seem to be a lot of enthusiastic Harrelson fans in the audience) and the fact that the company producing it happens to be the star's. This matinee is designed to engage younger audiences and to serve families unable to attend evening performances. The 95-minute production will comprise act one only of Stephen Sondheim and James Lapine’s musical Into the Woods. (school versions also eliminate the darker, scarier second act). The 8 pm full version will be presented as usual that night. Tickets to the special family-friendly matinee will be distributed for FREE primarily through the Virtual Ticketinglottery (www.shakespeareinthepark.org/matinee), with a limited number of tickets available through a stand-by line on the day of the performance. The Public Theater is also now accepting requests for a limited number of group reservations. Interested groups of 10 or more can submit a group request form available on-line at www.shakespeareinthepark.org/matinee.Groups will not be guaranteed tickets and orders will be processed in the order they are received. The Virtual Ticketinglottery for the family-friendly matinee will open on Wednesday, Aug. 15 at 4 pm and remain open through Thursday, Aug. 16 at 4 pm. Guests can register for up to four tickets and those who win tickets through the Virtual Lottery can pick their tickets up on Aug. 22 at the Delacorte box office between 12:30 and 2:30 pm. The Delacorte Theater in Central Park is accessible by entering at 81Street and Central Park West or at 79 Street and Fifth Avenue. Instead of the standard ticket distribution line at the Delacorte Theater, patrons may start picking up numbers for up to four tickets for a stand-by line beginning at 9 am at the Delacorte box office. Guests with stand-by line numbers can line up at 2 pm and any available tickets will be distributed beginning at 2:30 pm. for the 3 pm matinee. To accommodate the family-friendly matinee performance on Wednesday, August 22, tickets for the regular evening performance of Into the Woods at 8 pm will be distributed at noon that day instead of the normal 1 pm. Due to the afternoon heat, costumes may be modified for the family-friendly matinee. Greg Pierce's new play Slowgirl getting a run at Lincoln Center Theater's new Off-Broadway LCT3 stage also gives us a new way to look at communications and relations between generations and people who don't have a whole lot in common. The effervescent Becky is a sharp contrast to the meek Sterling, for whom doing eye-muscle exercises is a highlight of the day. It seems almost painful for him to contribute to the conversation, but Becky's prowess for long motor-mouth, profanity-laden passages in which she seems oblivious to Sterling's being in the room quickly fills the gap. Becky enjoys getting some of the stress over her situation off her chest -- no one back home believes her version of the situation, that it turns out, might land her in jail. The more she reveals details about a party in which she and her friends abused a mentally-challenged classmate they call Slowgirl who was seriously injured, the harder it is for Sterling to believe her either. He tries to provide comfort by sharing his hospitality, a sympathetic ear and hope through spiritual focus. Hauck's set lifts to reveal a labyrinth which Sterling has constructed and the scene where Becky is just not able to embrace the "silent" contemplation part of their walk is a hoot. Meanwhile, Becky discovers that Sterling has some skeletons in his own closet and that the self-induced exile in the jungle which has kept him from spending time with the sister with whom he used to be very close and his niece might be because he is avoiding the law as well. As the two people desperately in need of someone in their corner allow each other into their private worlds, a bond of friendship is formed during the week-long visit. It's a nice blend of nicely developed characters, a plot that isn't predictable and strong performances in the two-hander ably directed by Anne Kauffman.